The symptoms and severity of separation anxiety in dogs can vary – a dog who howls and whines when you leave – a dog who tries to break out of his crate – a dog who destroys things in the home when you leave – a dog who can’t be calm when you leave. It is a very frustrating situation and can lead to owners surrendering dogs. Some dogs can’t handle a lot of affection, excitement, and access to personal space without firm rules and structure. If the dog is a little anxious already, it is easy for him to get dependent on the affection and shared personal space, because it can make them feel more secure. And often when people pet or console an anxious dog, it is actually rewarding the dog for that behavior – so you will get more of the same. Then, when that person leaves, the source of security goes away, and the anxiety comes out full force! Another cause of separation anxiety is when a dog becomes addicted to the excitement and adrenalized state he lives in when his owner is home. 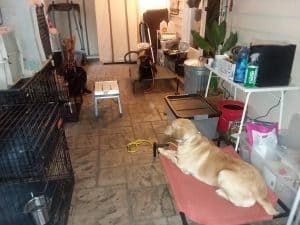 If the only time a dog is expected to be calm and relaxed in his crate is when the owner is away, that creates a problem, because any dog who lives in an over-adrenalized state will struggle when asked to hang out calmly. There are solutions for separation anxiety in dogs. If you put non-negotiable rules and structure in place, then the anxious dog can take more comfort and security from that structure where his choices are limited – thereby eliminating stress about the unknown. The dog generally has a job to concentrate on (like staying on “place”) and less opportunity to think about the things that make him anxious. Here, the dog learns to exist without constant affection or access to personal space, which helps him learn to be more comfortable on his own. Make coming and going no big deal. Minimize excitement when leaving or returning home. When crating your dog before leaving, keep things calm and quiet. When you return, take your time letting the dog out of the crate, and when you do open the crate, do so quietly and do not allow your dog to rush out, even though you and your dog are happy to see each other. Also, do not open the crate door until your dog is very calm and relaxed. If he is hopping around, overly excited, just wait until he calms down. Make your walk a structured walk. The structured walk means a your dog is calmly walking beside you, no pulling, lunging, sniffing, or marking. Greeting of other dogs or people is not allowed, because this can cause high levels of excitement. Staying calm on the walk can take time for your dog to learn and become good at, however it is a great skill that will carry over to being able to be calm in the home. Maintain overall calmness in the home. Observe your interactions and keep what causes your dog to be excited to a minimum. No high pitched voices, petting that amps the dog up, allowing the dog to jump excitedly, or letting the dog run around like crazy in the home. Use place command to create structure for your dog. Minimize the free roaming in your home by using the place command. Place helps the dog practice being calm and relaxed for long periods of time. It helps the dog to let go of the worry or stress about what is going on around him. A dog who follows you around the home and can’t let you out of his sight or reacts to every sound or thing he sees out of the window, is not a calm, relaxed dog. Correct crate antics to interrupt the cycle of stress. If your dog is carrying on in the crate with barking, whining, scratching, or howling, correct him. These are symptoms of stress, and it’s important to interrupt the cycle of stress and anxiety so that your dog can calm down. You can open and quickly shut the crate door. You can lightly slap the side of the crate or lift it to make an “earthquake.” For excessive barking, you can use a good quality bark collar like the Garmin BarkLimiter or the ECollar Technologies bark collar. Give your dog additional exercise when possible. Some options for this are treadmill training, obedience or trick training, structured play, etc. 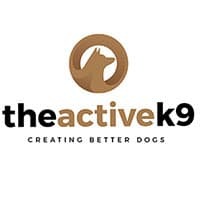 These activities work the dog both mentally and physically and will really tire a dog out. Fixing separation anxiety is a process which takes time, effort, and a close and honest look at your interactions with your dog. There are many little things that you can change which will add up to a big difference in your dog’s life. Getting rid of separation anxiety in your dog will allow you and your dog to have a better, more healthy relationship with more opportunities to do fun things and experience the best of life together. If you need help dealing with your dog’s separation anxiety, contact us. We’d love to work with you! For more training tips, how-to videos, and dog training updates, follow us on Facebook, Youtube, and Instagram!